I am an American expat mother living in England. I've been here since 1999, am married to a British man and have 3 children, all born in the UK. 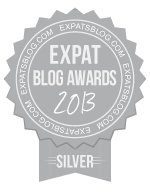 ExpatsBlog.com Expat Blog Awards 2013: England Silver Award! This blog won the Silver Award for best expat blog in England! I love Meghan's Bringing Up Brits Blog, always relevant, honest and thought provoking posts! Meghan got the conversation going on the topic of raising your children in a country that is not your own, this topic is relevant wherever you are doing this which is why her blog is so impactful. Meghan has created a community through her book and blog and that makes a lot of people feel more at home in their adopted country, the UK. I love reading Meg's blog! It is witty, funny and it makes me feel far less isolated living in England. Her blog is very relevant to me even though I do not raise my kids in England, I get great comfort from the feeling I am not alone out there. She has really built a name for herself as an expert with her blog, book and TV guest appearances! You really deserve to win Meg - good luck! I love the discussion about raising your kids in a different country than the one you were born in yourself. I'm a Brit in the Netherlands essentially raising Dutch kids and Meghan's blog about raising her kids as an American in Britain is eye opening and entertaining. Great insights into parenting in a foreign country. Great writing by Meg and a great and am sure, very well needed, blog. For those who move to the UK, this must be a really helpful and supportive read. Likewise, for those who are born and bred in the UK, it most certainly creates a whole new perspective around the difficulties people face when moving here. Great stuff. This blog is really well-written and always interesting. I am not an expat but I enjoy reading about life in this country from another perspective.